Whatever the work order entails, field service workers now have all the information they need to properly prepare and assess the job before they get there. This includes route information, customer/client information, work order details, care protocols, repair pictures and details, and more. Through their mobile devices, field service workers can understand and know exactly what each job entails. This works to help them prepare for service calls with the right equipment, tools, supplies, and understanding of exactly what they'll be facing. For instance, mobile devices can show pictures of the damage or problem field-service technicians will face before they get to the job. This helps alleviate mistakes with appliance models, misdiagnosis, and confusion with customer communication about the problem. Whether working as a third-party contractor or not, field service workers can use their mobile devices to communicate with dispatchers, co-workers, and managers on a deeper and more helpful level than ever before. Not only can they talk with them on the phone, but they can also use real-time video chat and file sharing to resolve any problems that may surface. For instance, caregivers and client managers can collaborate with care protocols and resolve questions about safely transporting their clients with real-time video chat; also, field-service technicians can video chat with inventory managers to identify unknown parts; or, insurance agents can ask their managers how to classify damage with a claim, etc. 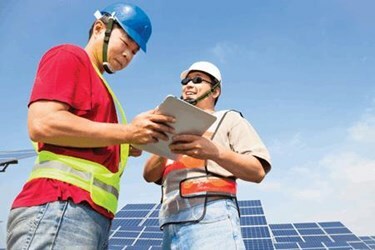 Real-time communication with file sharing, video chat, text, email, and voice, all further enable field service workers in their daily workflows, especially when they are connected to a common field service management (FSM) software that gives them real-time pricing, inventory levels, scheduling, care protocols, client and work order information, and more. Field service workers are on the front line when it comes to customer service; not only are they the key to making sure customers are satisfied, they're also the first to experience the customer's dissatisfaction when scheduling goes awry. The good news is mobile capabilities for the field service workforce includes smart scheduling, which greatly helps to assure scheduled times are met and customers are on the same page with appointments and expectations. FSM software not only allows customers to track field service workers on their way to their location, but it also allows them more visibility and accessibility around scheduling altogether. For instance, they can schedule their own appointment with real-time visibility with available times, as well as see who their technician or field service worker will be. Mobile capabilities help to ensure customer satisfaction by enabling field service workers to use smart-schedule routing technology to optimally arrive on time, as well as being able to directly communicate with customers and dispatchers on the go if any problems arise. Furthermore, FSM software gives field service workers more visibility with real-time scheduling changes and an easy-to-use interface to manage. Essentially, improving customer satisfaction also improves the morale and attitudes of field service workers as well. Instead of a cycle of frustration and anger, enhanced mobile capabilities will help foster a cycle of satisfaction and contentment, which is an immeasurable benefit of FSM software. If these benefits sound appealing, please schedule a demo and/or contact Service Power today to learn more about our innovative FSM software solution.